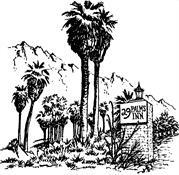 MacKenzie is a small, two bedroom space named after the exceptional artist Dean MacKenzie whose paintings you will see on display throughout the 29 Palms Inn, and the 29 Palms Inn Creative Center & Gallery. The entry room is a small sitting room, where you have two twin beds. The bedroom has a queen bed, and a large ensuite bathroom, with a wheelchair accessible shower. MacKenzie connects to the neighboring Guest House, perfect to rent together for large families and groups.